Enjoy the Old Orchard Beach experience. 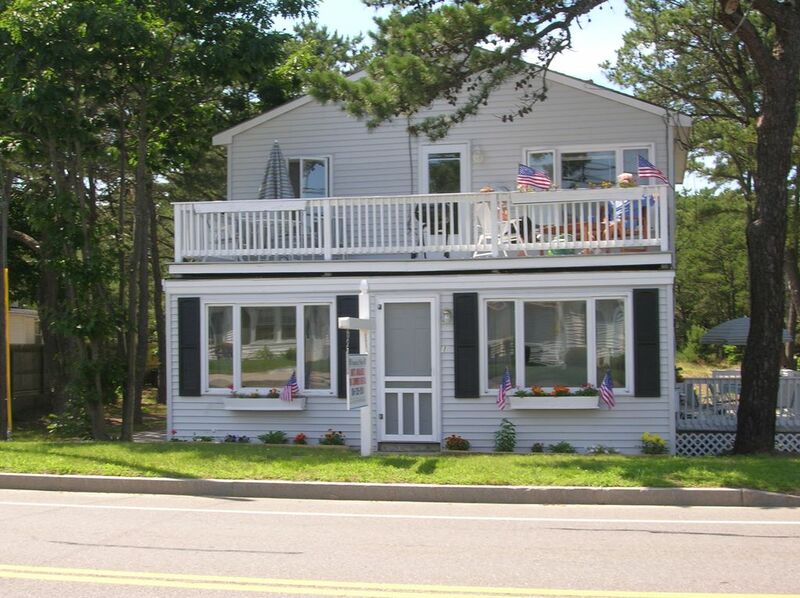 We are a 75 yard walk to the beach and only a 10 minute walk to downtown Old Orchard Beach with all of its attractions including Palace Playland, miniature golf, fantastic shopping and great restaurants. This first floor unit has a spacious living room, 3 bedrooms (2 bedrooms have full size beds and 1 bedroom has a sleeper sofa) that can sleep up to 6 comfortably. There is a sitting room with a futon that sleeps 2 more and a fully equipped kitchen, a comfortable wooden deck with furniture and a charcoal grill. Direct TV, wi-fi and bedroom AC units. We supply bath towels, wash cloths, kitchen towels, blankets, pillows and quilts. You will need to supply your own bed linens (all beds are full/double size). Seven miles of sandy beach where you can sun bathe, swim and body surf.You are 20 minutes from downtown Portland and the Old Port and 30-40 minutes from the Kennebunkport area. Enjoy fireworks on the beach every Thursday evening. We also have 2 other properties available at the same site. One has 2 bedrooms/1bath and sleeps up to 5 (Property 4490447) and the other is a 1 bedroom/1 bath and sleeps up to 4 (Property 4488806). Fully stocked kitchen with, dishes, glassware, silverware, pot & pans, microwave, coffee maker, and toaster oven. Fully equipped kitchens with microwave, toaster, coffee maker, cookware, and cooking and eating utensils. Full size refrigerator and stove in each unit. Off street parking for each unit available. A great location and great size place for our family of 6! The owners were awesome and communication was easy! We may just come back next year! We are so happy that you and your family enjoyed your stay with us at Nautical Point. We hope very much that you will join us again next summer. We love our repeat guests. Loved our stay at Nautical Point. Everything we were looking for. Great property and wonderful location. We are so happy you enjoyed your stay with us. Hope to have you as a guest again real soon. .
We enjoyed this beach house! This house was perfect for all our needs! The owners were wonderful from the first phone call, very helpful! The house was extremely clean and comfortable! Location was great. Close to everything yet private. We definitely will book again, no need to ever look at any other rental, we will always come back to Nautical Point every summer. The care taker across the street was so friendly. Took out the trash and always asked if we needed anything and made sure we were okay! Loved the house decor too~ perfect beach house! We are so happy that you enjoyed your stay with us. We pride ourselves on the repeat guests that we have each summer. We look forward to having you visit with us again in the near future and glad that you like our "perfect beach house". Remember at Nautical Point you are a guest for a night and a friend for a lifetime. Take care. Adorable and Very Clean Cottage!! My boyfriend and I stayed at the Nautical Point Cottage for the first time this summer and will definitely not be our last! The cottage and grounds were very clean and were equipped with all the household essentials as well as an AC unit and fans (a huge plus for the warm weather we had during our stay!) The cottage is also in a great location tucked far enough back for privacy but also close enough to walk back and forth from the beach as needed as well as a short distance from the Pier. We will certainly be renting again next year and have already recommended these units to family and friends! Thanks again John and Marta! We are so happy that you enjoyed your stay with us at Nautical Point. Repeat customers are what we are all about. Our moto at Nautical Point is "Guest for a Night, Friend for a Lifetime". We look forward to your return next summer. I just returned from a week stay at Nautical Point unit 2. I have rented this unit for the past 4 yrs or so, and friends rent the other units. It's a great place for a big group. The unit is clean, it has a private backyard, it's very close to the beach and walking distance to the Pier. The kitchen has all the basics, no need to bring anything. The owners are great!! It's a great vacation spot!! I've already book 2017 vacation!!! We are so happy that you and your group enjoyed another stay and keep coming back for more vacation memories at Nautical Point. We already have you booked for the same week next year. Take care. I've been going to OOB for an annual vacation for the past 8 yrs, this rental by far is the best I've stayed at. Owners and property manager are easily reachable if there is an issue, and very good service. The units are clean, AC and fans are provided. The location is great, short walk to the beach, Pier, Restaurant and shops. It has a spacious back yard, plenty of parking. There is a store and laundry just down the street. I will be returning next year and would recommend these units to family and friends. Thanks for your posting and we are happy you are coming back next year! Seven miles of sandy beach where you can sun bathe, swin and body surf. Enjoy fireworks on the beach every Thursday evening. Weekly Rate: $675 - $1400 Rates vary depending upon timeframe. July and August run from 875.00 to 1,400 per week. Spring and fall run from 400.00 perweek to 500.00 per week. Partial weeks are available during some weeks.